Although knife collecting, like any hobby, is a mild form of mania, I like to think that within this gentle madness I am a reasonable man. My uses for my tools are reasonable. My knife preferences are reasonable: I prefer simple handles, simple blades, and I generally like those blades at 3” or less. No one could look at my collection of knives and think me anything but a very reasonable individual – unless their eyes by chance fell on my Cold Steel Large Espada. How did I end up with such a ludicrous knife? Well, even though most of my purchases come after much consideration, reading, and weighing of pros and cons, every so often I like to impulse-purchase a knife that is out of my comfort zone, just to counterbalance the homogeneity in my collection that my preferences tends to create. But when I ordered the Large Espada late one night, I wasn’t just stepping out of my comfort zone; I was taking a flight to a location on the other side of the planet. No knife I can think of offhand (outside of some particularly egregious customs) so flamboyantly violates every edict of utility I’ve set for myself over the years like the Large Espada does. But, going beyond that, I don’t think that it’s a practical choice even for the applications for which it was ostensibly designed. The Large Espada is impractical. It is unreasonable. So this is going to be an odd review: an unreasonable knife reviewed by a reasonable man. But I like to imagine that even the palest, milquetoastiest accountant likes to cut lose once and a while. Sometimes you want to listen to Electric Wizard, not Glenn Gould. Sometimes you want to carry a giant, unwieldy tactical blade instead of a reasonable and non-threatening tool. And when those sometimes strike you, there aren’t many knives I know of that can scratch that itch quite like the Large Espada. The Large Espada has a blade length of 5 ½”, a handle length of 7 1/8”, and an overall length of 12 1/2”. It weighs 9.8 oz. – almost as much as four Benchmade 940-1s. The Espada is made in Taiwan. Of course, when you’re dealing with a knife of this size, it doesn’t make sense to get hung up on weight – after all, the 5 ½” blade folding knife isn’t exactly a crowded category, is it? Even very big knives like the Benchmade 710 or some of the Hogue knives aren’t really in the same size class. The only other reasonable competition for the Large Espada is the more affordable, all G-10 Large Espada, which weighs about 1 ½ oz. less. The Large Espada’s blade is a dramatic, theatrical, aggressive clip point. The tip is somewhat strengthened by the swedge, and will pierce material, even thick material, quite easily, but it gives the impression of relative delicacy. The edge is all belly, dipping out right after the ricasso. This, coupled with the (excellent) hollow grind and the wide edge bevel, give the Large Espada considerable cutting ability, at least on the macro level: cardboard, wood, plastic, metal, all can be separated cleanly and easily by this monster. Cleanly and effortlessly for a while, at least. The steel, AUS 8A, simply wasn’t the right choice here. If you want to use your Large Espada in roles other than self-defense, you’re going to use it for the macro cutting tasks I mentioned above, and when you do, you’ll find that AUS 8A dulls quickly. Editor’s note: in 2015 Cold Steel finally upgraded these to CTS-XHP steel. I have had some experience with Cold Steel’s CTS-XHP and it has been excellent. This should be a meaningful upgrade over AUS-8A. I have found that CTS-XHP holds an edge better and is tougher – a better choice all around. I’ve sharpened the Large Espada since then, and managed to reduce the chipping a bit, but it’s still visible, and I don’t think I was abusing the knife when it happened. I think it comes down to that wide edge bevel; AUS 8A isn’t tough enough to be run that thin at the edge. I understand that in the self-defense role, such issues are less likely to matter, but I still think that Cold Steel could, and should, have chosen a better blade steel than AUS 8A. Let us not forget that we’re talking about a $130 knife here. The Large Espada’s handle is comfortable no matter which way you hold it: forward, with your index finger in the choil, or in a pistol grip with the lower scalloping between your middle and ring fingers, reverse grip: it’s all good. The handle is comprised of two parts, almost in the style of a traditional knife: the aluminum ‘bolsters,’ which are integrated with the liners and the sort of grommet at the end of the knife, and the polished G-10 scales or inserts. Everything is decently if not artfully contoured, and all the edges are chamfered. I feel like a good portion of that comfort would be lost on the pure G-10 models: Cold Steel’s traditional unpolished G-10 is famously aggressive, and I don’t like it at all. It ruins your pockets, makes the knife uncomfortable to hold, and, let’s face it, looks a hell of a lot less classy than the original Espada’s set-up. If you’re going to get the Large Espada, get the original set-up. It is very comfortable in hand. In the pocket? Not so much. I can fit the Large Espada into the pocket of my jeans, but just barely, and even though it doesn’t feel as heavy as I was expecting, it sure doesn’t disappear. And this is where I take issue with the Large Espada in its intended role as a self-defense tool: issues of legality aside, it’s almost too big to carry around every day, even as a dedicated tactical blade, to use the Nutfancian term. I know a lot of smart guys who carry multiple blades, but I am a one-knife man, and I don’t have enough pocket space for a second knife of any size, let alone something as elephantine as the Large Espada. Maybe I’m doing it wrong, though; Tool carries his in in a kydex boot sheath. Might be worth looking into. More problems arise with the deployment methods on the Large Espada. There are two, although they both utilize the thumb plate on the spine of the blade. The first method is your traditional roll/flick open. Either is difficult to do reliably or quickly because of the size of the Large Espada. Rolling it out requires your thumb to stretch quite a bit, so it isn’t comfortable or fast. Flicking it takes a lot of wrist momentum, as well as careful placement of your thumb on the plate. The disk is also designed to be wave deployed; that is, you can draw the Large Espada from your pocket in such a manner as to cause the plate to catch on the corner of your pocket, deploying the blade as you pull it out. Wave openers, to me, aren’t handy enough to compensate for the awkward stares and for the accidental half-openings that can occur, but this one is particularly finicky. In my last review I wrote that every big blade I’ve had has some bladeplay. I guess I have to eat a little crow because that isn’t true: I had forgotten that my Large Espada has none, whatsoever, in any direction. It did when I first got it, but earlier this year I took it apart, cleaned everything, and put it back together a little tighter, and it was totally gone. The Tri-Ad Lock truly deserves every accolade thrown its way. As ambidextrous as the Axis Lock, but with less moving parts, and tougher than a frame lock, it is a marvel. A weak lock on a knife this big would be an absolute disaster, but with the Tri-Ad Lock in place I have absolute confidence that my Large Espada will only close when I want it to. So I’ve spent 1,500 hundred words enumerating all the ways in which the Large Espada is an impractical purchase. It’s huge, the steel is iffy, it’s huge, the design is aggressive and off-putting to those around you, the deployment methods are a bit of a pain, and it’s huge. I never carry blades for reasons of self-defense. I don’t think it’s a silly thing to do, but it’s just not something I’m interested in doing. However, even carried as a self-defense knife, I think there are better options out there than the Large Espada; even in that role it is impractical. But, hey (and turn up the metal for this next bit), sometimes you just want a huge, badass knife. Something for the collection, something that looks rad, is made well, and never fails to make you smile (maybe a little self-consciously), when you take it out to show somebody, thwacking it open and watching their eyes go wide. I bought the Large Espada on a impulse. It wasn’t cheap. I hardly carry it. I usually only take it out every couple of months, and even then just for a few minutes. I forget that I own it for months at a time. It’s ludicrous. It’s impractical. It’s unreasonable. I’ve never regretted buying it. I recommend purchasing the Cold Steel Espada at Amazon or BladeHQ. Please consider that purchasing anything through any of the links on this website helps support BladeReviews.com, and keeps the site going. As always, any and all support is greatly appreciated. Thank you very much. I almost entitled this review “confessions of a mall ninja”. Yup, your buddy Dan has something of a dirty secret: I’m a fan of ridiculous knives from Cold Steel. You may have guessed as much after reading reviews of the Spartan and XL Voyager. I just didn’t talk openly about it. The truth is I think some of these more outlandish Cold Steel knives are fun, and some are also legitimately good knives. And let me add that there is something about buying a folding knife knowing you can blast through a side of beef with it (whilst rocking out to heavy metal music) that lends a certain pride of ownership that I don’t quite get with my Delica. There is a je ne sais quoi, if you will, with select Cold Steel products. It keeps bringing me back. The Rajah series is among their more mall ninja-y folders, but, as with most things, there are shades of gray. If you want to go full ninja then check out the oversized Rajah II. If you are secure, but not quite Open-Carry-Bear-Mace-On-Your-Web-Belt secure, then there is the more middling Rajah III, which also happens to be the subject of today’s review. Some might argue the Rajah III is small enough for normal people to carry. Some might argue it’s not for mall ninjas at all. Some might argue I’m a jerk for even implying that the knife may be for mall ninjas. Regardless of your personal proclivities, I’ve had my eye on it for some time. The Rajah III has an overall length of 8-3/8″, a 3-1/2″ blade, and weighs 4.4 ounces. Despite being the smallest version in the series it is still a big knife. It’s not totally ridiculous for me to carry, but at close to 3/4 of an inch thick, this is one I feel in the pocket. Definitely an after hours carry for me. The Rajah II with it’s 6″ blade is a dedicated outdoor tool, or perhaps a mostly a folding novelty. The Rajah series was designed by Andrew Demko, who has designed a number of great folders for Cold Steel. Apparently, the classic Nepalese kukri was the inspiration for this design. Cold Steel waxes poetic about the “dramatic power of the kukri as both a tool and weapon” in their product literature. I can attest that kukris make for great choppers, but here we are talking about a 4.5 ounce folding knife. The blade is kukri shaped. I guess that could be described as a modified clip point with a recurve if you wanted to try and get technical. It has the big kukri belly and a deep recurve. The recurve isn’t quite as crazy as the Spartan’s, but it is still pretty serious. The 4mm thick blade tapers down to the tip, and has been given a full flat grind. It slices well – especially with that recurve. The knife carves aggressively too. I was very pleased with how this blade performed, and think there is some truth to the Cold Steel sales copy regarding kukris. Sharpening can be a chore, but there is truth to this being a high performance blade shape. Cold Steel initially offered the Rajah III with a bead blasted blade finish (shown here). Not my favorite choice, but it works. They have since updated the knife to feature a stonewashed / tumbled finish. I prefer that finish over the beadblast as it is not as susceptible to rust and I think it looks a little nicer. Cold Steel originally offered the Rajah in AUS8. They changed the steel to BD1 in 2015-2016. Both AUS8 and BD1 are softer steels. Cold Steel got a lot of feedback from customers wanting something with better edge retention than AUS-8, so they upgraded their premium line of knives to CTS-XHP (and then S35Vn in 2018), and their more budget oriented knives they upgraded to BD1. I don’t have a lot of experience with BD1, but it’s a softer steel. Easy to sharpen, and presumably holds a better edge than AUS-8. I think it was a good option for the Rajah series as the price is still reasonable. On the subject of sharpening, I sharpen this knife with the rods of my Spyderco Sharpmaker. Rod style sharpeners are best for curved blades like this. You will have an extremely hard time trying to sharpen this with bench stones or paddle sharpeners. Much like the Spartan, the Rajah’s handle is grivory (high density plastic) over full nested steel liners. The back spring is hardened steel, and the backspacer is more grivory. Everything has been screwed together for your convenience. This is a lightweight yet strong handle design that has been meticulously crafted. This knife is made in Taiwan, and like virtually every other knife from Taiwan that I have handled, it has been really nicely finished. They even included a lanyard hole. Andrew Demko is a man who clearly understands ergonomics. His designs are among the most comfortable I’ve handled, perhaps only second to Ernest Emerson. Although the Rajah III is a scaled down version of the Rajah II, you aren’t sacrificing a comfortable grip. I take a large glove and there is just enough room for a good full grip. You can move up on the handle for more detailed work, and lean back into the handle for light chopping. The Rajah III also feels very at home in reverse grip. There is no jimping, and the scales have been given a very light texture. I’d say its pretty much perfect for my applications. Like on many of their other designs, Cold Steel has included two pocket clips: one for each side of the curved handle. They also included 2 sets of screws, which is a nice touch. These clips don’t allow for super deep carry, but it is still a fairly discrete package. The clips are simple but they work well. They have been given Cold Steel’s trademarked crappy black teflon coating, so don’t expect them to look new for long. As far as carry is concerned, this is a thick knife and you will feel it in your pocket. It isn’t very heavy for its size, so it has that going for it, but I can’t deny that this is a bulkier knife. 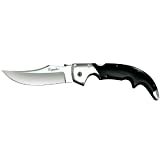 If you are looking for a very discrete slim line EDC knife then I would look elsewhere. The Rajah makes use of a large thumb plate for deployment. You can push the blade open with your thumb, or the plate can function similarly to an Emerson Wave, allowing you to open the knife from your pocket. With a little wrist action I can flick the knife open with my thumb. The strong backspring gives the closed blade a healthy “detent” (resistance to opening). I will say that the action of this knife is extremely smooth. Smooth to the point where the blade will fall freely on it’s own upon disengaging the lock. Cold Steel has equipped the Rajah III with their tri-ad lock. For the uninitiated, the tri-ad lock is an improved back lock strengthened by the inclusion of a hardened steel stop pin between the tang of the blade and the lock bar. This stop pin absorbs much of the shock that would otherwise transfer directly to the locking mechanism and potentially compromise the lock. In my experience these tri-ad lock knives are tough. My knives have held up well over the years without failing, developing blade play, etc. In addition to normal use as an EDC knife, I did beat on this knife a bit in my back yard. I chopped through some bamboo and hacked away at firewood – stuff I wouldn’t normally do with a folding knife. The knife held up beautifully. The way I see it, the only downside to the tri-ad lock is that it can be tough to disengage – especially with one hand. Is the Rajah III a realistic EDC option, or is it going to be on the cover of next month’s “Mall Ninja Monthly”? I think the truth lies somewhere in between. While the Rajah III is aggressive looking and somewhat impractical for your average suburban/urban EDC, I cannot deny that this is a solid tool that is capable of getting real work done. It may not be the most convenient choice for an armchair general like myself, but I still respect and the Rajah III for being well made, and enjoy how it is a little different than the rest of the knives in my collection. Also, the fundamentals to the Rajah are solid: the tri-ad lock is extremely sturdy, the knife is lightweight yet strong, the handle is comfortable, the blade slices and dices with the best of them, the fit and finish is extremely good, and the price is very attractive. If you want a no-nonsense, high performance Cold Steel lockback folder with a 3.5″ blade then I suggest checking out the American Lawman. The Lawman continues to be one of my favorites. It is slimmer than the Rajah III and less intimidating. In my mind it is clearly a more practical EDC choice. But if you are looking for something a little further out there, and like the lines of the Rajah series, then check out the Rajah III. For $45 this is a tremendous value and an excellent knife. I like mine a lot. I recommend purchasing the Rajah III at Amazon or BladeHQ. Please consider that purchasing anything through any of the links on this website helps support BladeReviews.com, and keeps the site going. As always, any and all support is greatly appreciated. Thank you very much. When you get into collecting knives it is easy to get caught up in the moment. There is so much cool stuff out there if you aren’t careful you can easily get sucked away in a torrent of carbon fiber and titanium. And really there is nothing wrong with that (although your bank account/significant other/retirement plan is free to disagree). But sometimes you just want a tool that will get the job done without having to spend a ton of money. This is how a lot of us got started with collecting knives, and for some level-headed individuals it remains their approach to this day. Personally, I try to strike a balance when building my collection. I like smart designs that provide great value, but also am known to indulge in the new and shiny. So this time around we are going to head back to earth and check out a cool, reasonably priced knife from Cold Steel: the Mini Tuff Lite (or “MTL”). It isn’t the sexiest blade in the collection, but for those who don’t wish to shell out $200, $100, or even $50 for a quality knife, the MTL brings you edged excellence at a sub $25 price point. 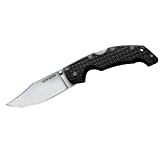 The Cold Steel Mini Tuff Lite is 5″ long, sports a 2″ blade (1.25″ edge), and weighs a mere 1.7 ounces. What drew me to this knife are the striking similarities to one of my favorite little EDC blades, the Spyderco Dragonfly II. It’s right around the same size and weight, and also features thumb holes and a back lock. The biggest difference is the price – the Dragonfly goes for $45+ while the Mini Tuff Lite can be had for right around $25. Needless to say both knives make for great little EDCs. I like pairing the MTL with a larger knife although it easily accomplishes 95% of my EDC tasks. It is also a nice little option for a first aid kit, pocket survival kit, or any other place you would like to stow a small folder. If you want something bigger, Cold Steel also offers the full size Tuff Lite. The blade is a wharncliffe shape. It’s a very functional shape, with a precise tip and razor edge. The steel is thick enough for serious use (2.5mm thick), and the hollow grind makes for a capable slicer. I will say that the sharpening choil and ricasso can get caught up on material that I am cutting (eg, cardboard), especially if I’m trying to really blast through it. That is to be expected from a 1.25″ edge. If you have a big job, I recommend a larger knife. Steel on this knife is Cold Steel’s AUS8a. Stainless and relatively soft, AUS8 won’t hold an edge forever, but it gets very sharp very fast. I have no problems maintaining a hair shaving edge with this knife, and it doesn’t require any special skills. No issues with rust or corrosion either. Given the price, AUS8 is a great choice here. The handle of the Mini Tuff Lite is some sort of plastic (Griv-Ex™ according to Cold Steel). It’s tough and lightweight – entirely adequate for my mostly suburban purposes. Construction is very good. Three bolts hold the small handle together, and everything is nicely finished. There is a large lanyard slot for those who like lanyards, and all the corners are nicely rounded. From an ergonomics perspective the MTL is very impressive. Much like the Dragonfly II, the MTL makes use of a forward choil. This allows you to really choke up on the blade, but it also affords you a full four finger grip. I really like to have a full grip on my EDC knife so for me this is exceptional. The plastic handle is lightly textured, and the spine of the blade is sparsely jimped. I find that this is plenty of traction and makes the knife both comfortable and practical to use. The pocket clip is where you start to feel the budget aspects of this knife. Satin finished, and positioned for right side tip down carry only, it’s not as feature rich as some of your higher end knives. That said, there is still a lot to like here – retention is excellent and the knife is very discrete. I tend to forget it is clipped to my pocket, often having to double check before heading out the door. I think the lack of multiple carry options is a really minor issue as the clip generally works well, and the knife carries like a dream. The Mini Tuff Lite makes use of a oval thumb hole for deployment. It’s small, but the sharp edges of the thumb hole make it easy to get at, and with a little effort you can manipulate the blade open. This isn’t the fastest draw in the west, but once again given the intended use I find it adequate. There is a firm backspring holding the blade closed, so you don’t need to worry about accidental deployments, but care should be taken when closing the knife as the blade tends to snap down with speed. For the locking mechanism Cold Steel went with their most excellent Tri-Ad lock. For the uninitiated, the Tri-Ad lock is an overbuilt lockback with an added stop pin. This makes for an extremely strong lock, and is far superior to your regular lockback. You can really feel this when aggressively carving. I tested both the Mini Tuff Lite and the Dragonfly out on some 2x4s, and you can feel the the lockback on the Spyderco flex under the pressure of a strong push cut while the Tri-ad lock remains rock solid under pressure – a testament to the exceptional design of this locking mechanism. Lets face it, the Cold Steel Mini Tuff Lite wasn’t designed to win any beauty contests. This is definitely an instance where form follows function. But there is something endearing about the MTL. A face only a mother could love. And if you need a small, lightweight, and inexpensive tool to get the job done I think you will be hard pressed to find a more outstanding value. This little knife is rock solid and capable of providing years of service. Plastic and AUS8 are a far cry from cutting edge knife technology, but the MTL will still happily satisfy the vast majority of your EDC chores. 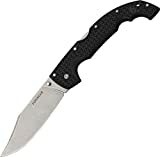 For those interested in a Spyderco Dragonfly or a Benchmade Mini Griptilian, but are unwilling to pay the $50 and $80 price tags I give the Mini Tuff Lite my full endorsement. In fact, this is a great small EDC knife regardless of what you compare it to. 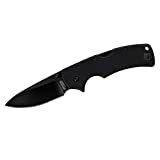 I recommend purchasing the Cold Steel Mini Tuff Lite at Amazon or BladeHQ. Please consider that purchasing anything through any of the links on this website helps support BladeReviews.com, and keeps the site going. As always, any and all support is greatly appreciated. Thank you very much.